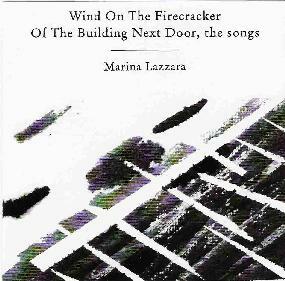 Marina Lazzara - "Wind On The Firecracker Of The Building Next Door, The Songs"
I'm not familiar with musician and poet Marina Lazzara's work, but I couldn't wait to spin this CD after reading in the promo sheet about "noise folk" and "where experimental meets the song". Sure my tastes tend toward the strange and freaky, but I still enjoy a well written song and a pleasing melody. So anyone who attempts to bring those worlds together is going to arouse my interest. After a bit of drifting noise, a guitar begins to strum a pleasant melody and Marina starts to sing. Recorded in a single afternoon in Ernesto Diaz- Infante & Marjorie Sturm's living room, the music has a lo-fi but heartfelt quality. Marina has a beautiful voice and her acoustic guitar strumming is simple but entrancing. Noise patterns serve a transitional role between some of the songs, providing part of the album's experimental edge. Other than that the first several tracks seem fairly accessible. I like the slightly winding phased guitar efx heard on "Words, Birds, Sun Stickers and a Road", which take the song into an otherworldly dimension. But starting with "The Backdrop Line" the music devolves into heavy sonic aggression with a harsh stoner guitar dirge that backs Marina's vocals. Ditto for the next track, "Ferris Wheel Song". Wow, those took me pleasantly by surprise. But Marina continues to bounce around, having torn up the listeners insides a bit she soon returns to the melodic acoustic folk that opened the album. Quite an interesting set of songs. It doesn't work consistently throughout the album, but I did come away from it feeling like I'd heard something a bit different. Contact via snail mail c/o Pax; PO Box 591138; San Francisco, CA 94159-1138.